Showtune Sunday: Barbra, Beyonce, Celine, and others tackle “Somewhere” from “West Side Story.” Which is best? Monday Morning Man: Pierre Spies! It’s been fun watching a bunch of different versions of the ballad Somewhere from West Side Story. So many great singers have covered it from Streisand to Beyonce to Lea Michele and Idina Minzel and in an episode of Glee. Would love to find out which of these is your favorite. I’m going to have to vote for Barbra who recorded it for The Broadway Album. I’m with you. I think “Somewhere” is one of the most beautiful songs ever written, and Barbra’s version gives it a mystical, mythical power that transcends other versions. The pristine soprano voice of Julie remains the standard of vocal beauty and expression. 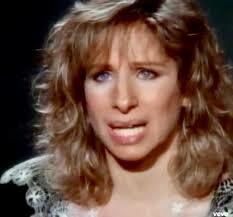 Although I’m a fan of Barbra, Julie is the only one who sings the song as Bernstein wrote it. Barbra’s version is the benchmark. Morning Man Classic: James Garner!